Pendle at Easter – It really doesn’t matter when this Croquet event falls, the Earby weather always helps to test croquet players in varied conditions: cold, warm, wet or windy, pick your day and/or combination. Only 13 entries this year dipped in and out of the four day event, even the manager was part time this year! Because of the low numbers entered, it was a huge treat to play all croquet rounds across the five superb courts as single banked – no mucking about with markers required. Catering of course was well up to this club’s very high standards (although this reporter was upset to miss out on Fridays home made Hot Cross Buns). 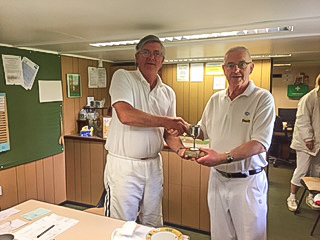 Peter Dowdall Cup (adv) – defended by David Walters. 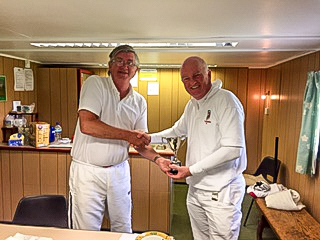 Thanks to David Walters for publishing the games on Croquetscores (https://croquetscores.com/2017/ac/john-beech-memorial). 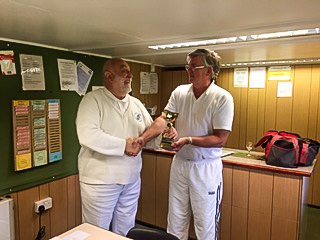 Manager Paul Rigge presents the John Beech Handicap Trophy to Roger Staples. Manager Paul Rigge presents the Peter Dowdall Cup to David Walters. 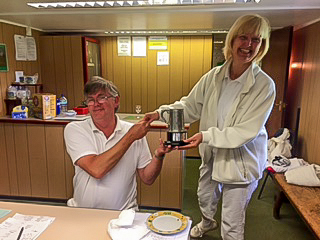 Manager Paul Rigge presents the Fastest Game Trophy to Betty Bates. Manager Paul Rigge presents the 10 Plus Handicap Trophy to Joe Lennon.